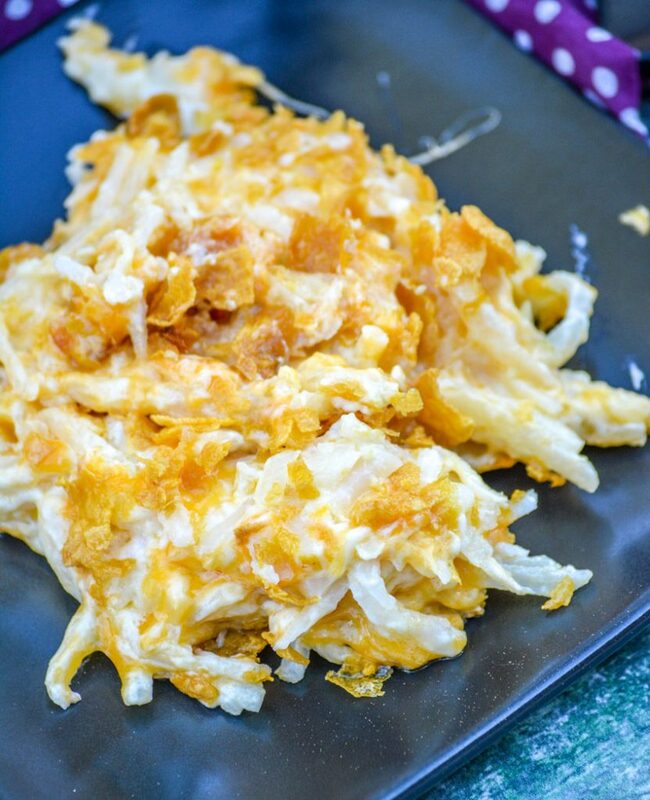 Shredded hashbrowns & cheese were always destined to be a match made in heaven. 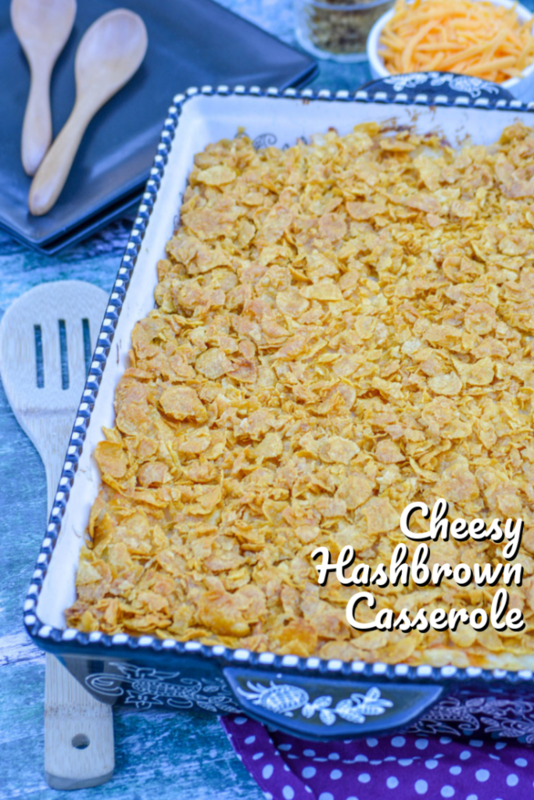 This Cheesy Hashbrown Casserole is the crazy delicious, almost addictive result. Whether it’s served as part of breakfast or brunch, or as a delicious side dish to dinner- you can’t go wrong with such a crowd-pleasing recipe. Ever been to a Cracker Barrel restaurant? They have a cheesy potato casserole. Have you spent any time in the mid-west? They’ve got this delicious side called funeral potatoes. Somehow a recipes for cheesy potato goodness has managed to end up with slightly differing variations all over the country. Ending up with our own humbled version here in Central Virginia- the Cheesy Hashbrown Casserole. Could there ever be a bad combination that involves cheese & potatoes? I for sure can’t thing of a single one. As a side dish, thrown into a casserole, fried, baked- cheese & potatoes were born to be best friends. And it shows! Add to that a buttered, crunchy topping- my taste buds were blown the first time I tasted this. For years it’s been a holiday staple for us. Mostly for brunch, Christmas morning & Easter morning- and lots of Sundays after that because it pairs so well with thick slices of leftover ham. This dish starts off with one of my favorite things to keep stocked in my fridge and/or freezer. 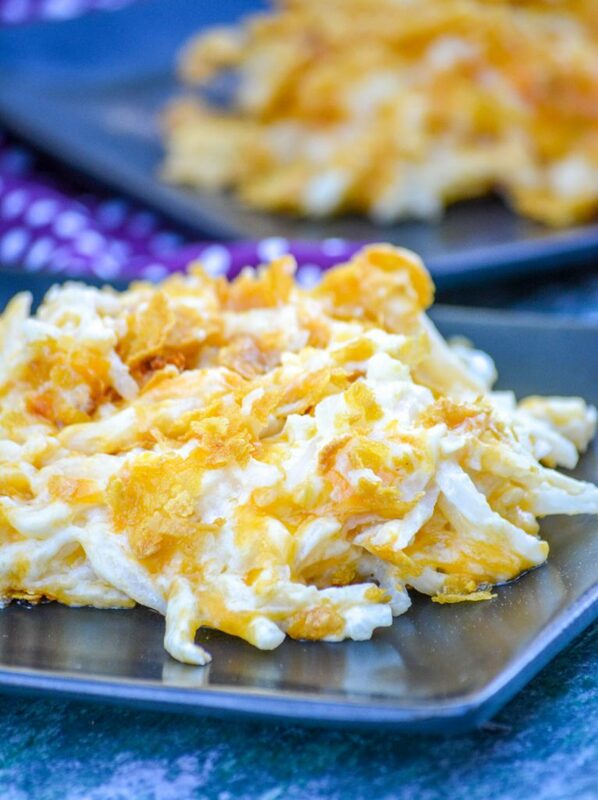 Shredded hash browns. Yes, I could peel, shred, and wring out my own potatoes- but that’s so much work. A busy Mama doesn’t always have time for the from scratch, start to finish stuff. At least not this one. So, I like to have options and spring for the occasional short cut. 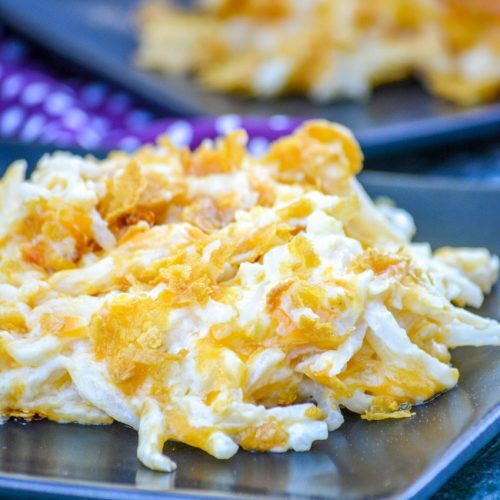 Shredded hash browns are great for so many things too. I have used them in place of traditional chopped potatoes in potato soup. As the base to make a crust for one of our most loved quiches. Then, obviously in casseroles. Ok, so when ready to assemble I just grab a 20 oz bag of shredded hash browns out of the fridge. After that, it’s only a handful of ingredients I need to gather to really get started. Five ingredients to be exact- a can of cream of chicken soup, shredded cheddar cheese, sour cream, a bit of minced white onion, and some melted butter. Butter’s a lot like bacon. It improves almost everything it touches. So obviously I used it more than just once in this divine dish. 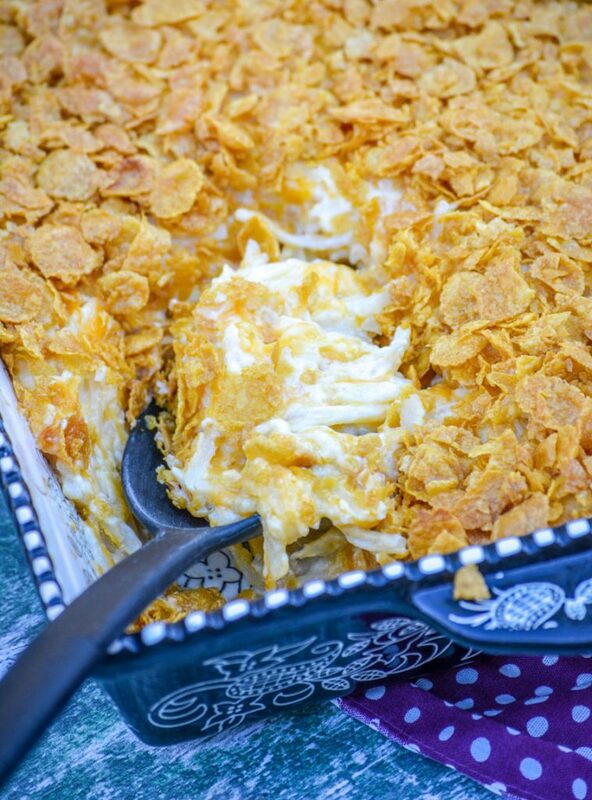 Not only is it in the casserole itself, but also in the crunchy corn flake topping. All of the casserole ingredients are mixed together in a large bowl. Make sure everything’s evenly combined, so it’s all coated in creamy cheesy goodness. Prep a casserole dish with non stick cooking spray. 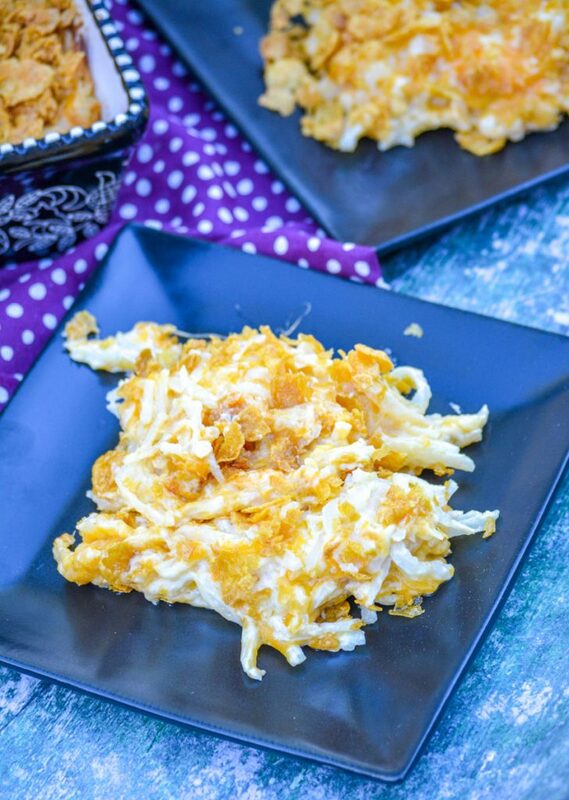 Scoop the hashbrown mixture into the dish, and use a spatula to gently spread it out into an even layer. Set it aside. 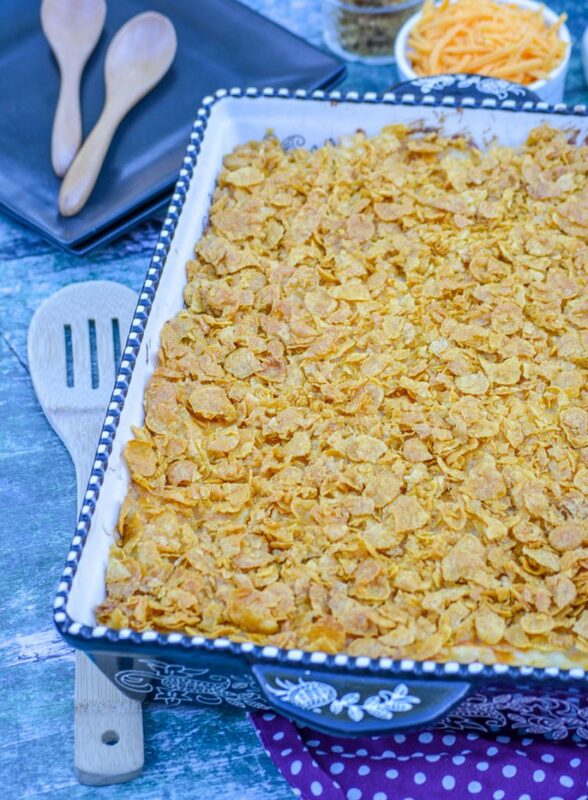 In another mixing bowl, toss together corn flake crumbles and melted butter until evenly combined. Spoon this mix evenly out over the hashbrowns. Bake the casserole at 350 degrees for 45 minutes, or until it’s hot and bubbly with a golden brown topping. Let the mixture rest for a minute or two before scooping & serving. There’s no greater comfort food than a heaping helping of this Southern staple- cheesy hashbrown casserole. It’s the original side dish, and pairs perfectly with so many different options. In a large mixing bowl, add all of the hash brown ingredients. Use a spatula, and stir until they're all evenly combined. Spray a casserole dish with non stick cooking spray, and then transfer the hash brown mixture to it. Use a spatula to evenly spread the mixture out. In a medium mixing bowl, whip together the topping ingredients- until evenly combined. 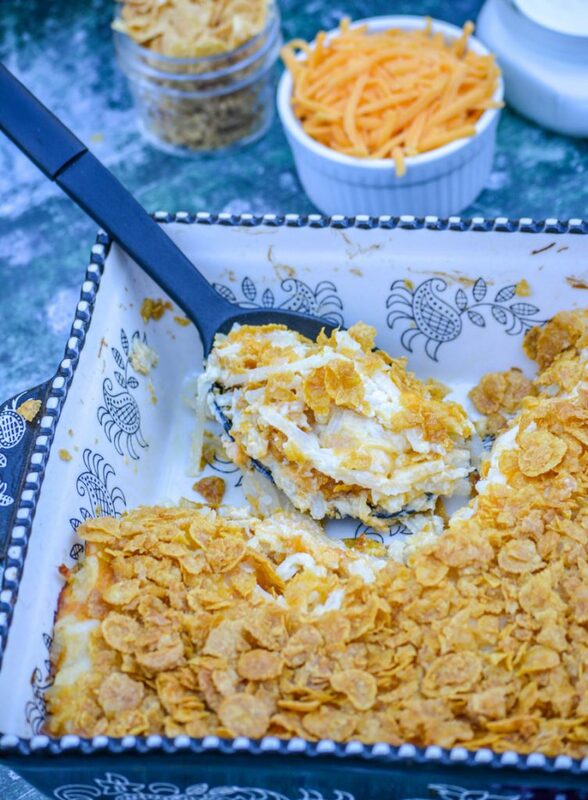 Spread the corn flake topping evenly out over the casserole. Bake the dish at 350 degrees for 45 minutes, or until the casserole is hot & bubbly and the corn flake topping is golden brown.